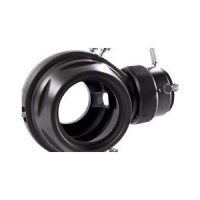 The Celestron Large SCT/EdgeHD Adapter was made especially for our Off-Axis Guider (C93648, sold separately, click here). When paired, these two imaging accessories allow you to use the full image circle created by a 9.25", 11" or 14" SCT or EdgeHD telescope. This configuration is especially helpful to owners of larger format cameras, such as the Canon 5D Mark III or the 6D, since their full frame can take advantage of the more substantial area of illumination produced by larger SCT and EdgeHD telescopes. Custom-designed to pair with the Celestron Off-Axis Guider (#93648) and a 9.25", 11" or 14" SCT or EdgeHD optical tube. Great for larger format cameras like the Canon 5D or 6Dƒ__allows use of the full image circle for better illumination of the sensor.